Hot on the heels of Govind Armstrong's Post & Beam is another new opening for 2012: Little Bear, a new Belgian-esque bar and beer cafe in Downtown, situated in the former space of Royal Clayton's, right across the street from Church & State. The bar/restaurant is the work of longstanding LA chef Andre Guerrero and Ryan Sweeney (The Surly Goat, Verdugo Bar), and debuted just past the New Year on January 6th. About the Chef: Guerrero was born in Quezon City, Philippines, one of 10 children of Liwayway and Ruben Guerrero. His grandfather came from Lyon, France, and served as the Philippines' first French consul general, thus exposing Guerrero to the consul's bevy of French and Chinese chefs at a young age. However, his family ended up moving to the US when he was six, settling in the Glassell Park neighborhood of Los Angeles. Here, under the tutelage of his parents, both of whom were great cooks (with his father specializing in pastry), Guerrero further solidified his passion for food and dining. Eventually, he did attend college, studying art and pottery at UCLA. Cooking, however, quickly beckoned, and Guerrero soon found himself working at his family's Cal-French-Filipino restaurant, Cafe Le Monde in Glendale, which his parents had opened in 1979 (it shuttered in 1987). From there, he moved to Stoney Point Bar & Grill in Pasadena, then to Bernard's at the Millennium Biltmore Hotel, working under Executive Chef Roland Gibert. Following, Guerrero transitioned to Larry Nicola's L.A. Nicola in Silver Lake, and later, in November 1985, to Alice's Restaurant on the Malibu Pier. It was here that the Chef really started making a name for himself, and he soon became a partner in the restaurant, along with longtime proprietors Bob Yuro and Peter Palazzo. The success of Alice's allowed the trio to open up California cuisine eatery Brio in Tarzana in October 1988, along with an adjoining Brio Bakery a couple years later. Guerrero, however, would leave the partnership in 1993 to work on his first solo project, Duet in Glendale, located in the former site of Shaker Mountain Inn. The 250-seat Duet opened in June that year, with the Chef working side-by-side with his Chef de Cuisine Robert A. Sperry, who also happened to be his brother-in-law, and who also cooked at Alice's. The restaurant received good marks for its food, but the economics didn't work, forcing Guerrero to close up shop in June 1995. Following this setback, the Chef spent some time cooking in his native Philippines, and also mourned the loss of his father, who passed away in 1996. After taking some time off, Guerrero popped up at Sherman Oaks' Signature Grill in late 1997, but was out the door by the end of January. He found new employment quickly though, landing a consulting role for restaurateur John Makhani. In March, he debuted a new menu at Prezzo Restaurant, also in Sherman Oaks, then moved to Makhani's Villa Piacere in Woodland Hills and Barefoot in Hollywood. 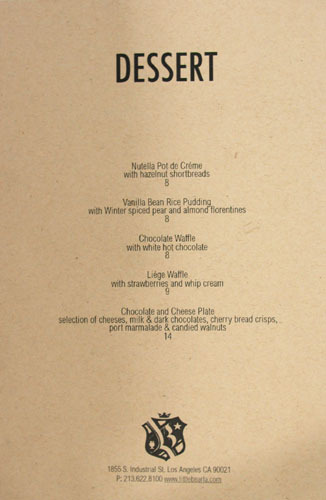 Then, in January 2000, the Chef joined forces with Mario Oliver to launch Linq in the old Limbo space on West 3rd (the former home of Christophe Émé's Ortolan). The Dodd Mitchell-designed restaurant was a huge success, becoming one of the hottest tickets in town and one of Esquire's "Best New Restaurants" of 2000. However, Guerrero would leave Linq in February 2002 to open Max in Sherman Oaks with partner Michael Lamb (ex-GM of Saddle Peak Lodge); the restaurant debuted in March. Named after Guerrero's younger son, Max occupied the site of the former JoeJoe's (Joe Miller's old spot) and served up the Chef's version of Cal-Asian fare, which quickly garnered him accolades and another nod from Esquire. In April 2003, Guerrero launched Señor Fred (named after his older son), an upscale Mexican-ish eatery that also became quite a hit. However, the Chef ceased involvement with the restaurant in 2005, and sold his remaining stake to Lamb. 2006 saw the debut of The Oinkster in Eagle Rock, which became a legend in its own right, known for its Belgian fries, Carolina-style pork BBQ, and house-smoked pastrami. By 2008, the City was in the midst of the Great Recession, and declining business at Max forced Guerrero and company to retool the restaurant. By August, Max was transformed into a more casual affair, focused on lower prices and smaller plates, albeit with the same Cal-Asian cachet. 2009 saw a bit of a rebound in the dining scene. In March, Guerrero partnered with Adolfo Suaya (who also owns Peruvian eatery Osaka) to launch the Kris Keith-designed BoHo gastropub in the old Charcoal space on West Sunset. September, meanwhile, marked the demise of Max, which was turned into Marché, with Guerrero out of the kitchen, though still involved as a partner. Instead, it was Gary Menes (who worked under Octavio Becerra at Palate) helming the stoves, dishing out his own market-driven menu. Shortly afterward, Guerrero began plans to purchase Butter Tart Bakery in Glassell Park and transform it into a breakfast and lunch place, but the idea ultimately fell through and was scrapped by March 2010. A couple months later, Guerrero left BoHo due to creative differences, and was replaced by Tony Trujillo, former Executive Sous Chef at Michael Mina's Stonehill Tavern. Trujillo's tenure was brief, however, as BoHo ended up closing in October that year, only to reopen in April 2011 at a new spot at Hollywood and Highland, with Chef Wesley Pumphrey (The Bazaar, Craft) in charge. Marché, meanwhile, had folded in May 2010. The restaurant hosted LudoBites 6.0 toward the end of the year, and was eventually transformed into Brats Brothers. Then came word of Maximiliano, Guerrero's vision for an old school Italian-American eatery with a twist, named, once again, after his son Max. 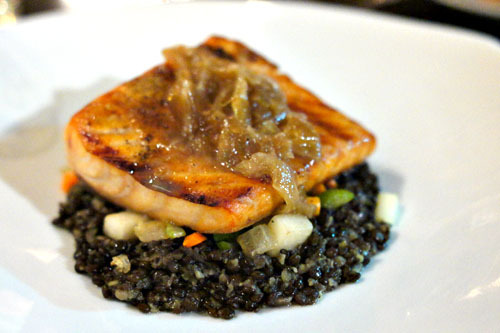 The restaurant bowed in October 2011, taking over the location of Juanita's/La Casa Blue in Highland Park with Max, Fred, and Pastry Chef Jan Purdy (whom the Chef met prior to Linq) all involved; there's even an attached bakery opening in the future. Guerrero, of course, quickly followed up Maximiliano with Little Bear, launched in partnership with BoHo compatriot Ryan Sweeney in the LA Arts District. The basic layout from the space's days as Royal Clayton's remains, though the room has been brightened up considerably. The bar has had its layer of black paint removed to reveal the walnut grain underneath, and has also been spruced up with the addition of gilded beer names hand-painted on the trim. 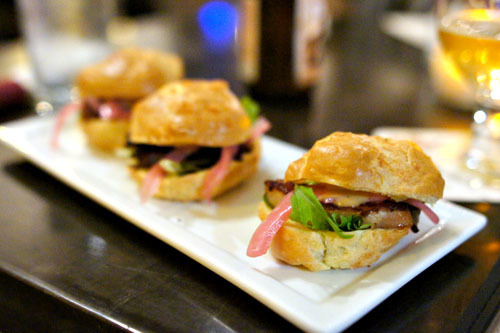 Little Bear's menu features straightforward gastropub-y type fare, with a Belgian slant. Click for a larger version. 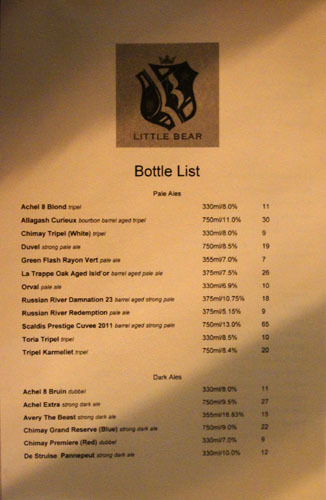 Ryan Sweeney's the man in charge of Little Bear's beer list, and he's done a fine job with it. 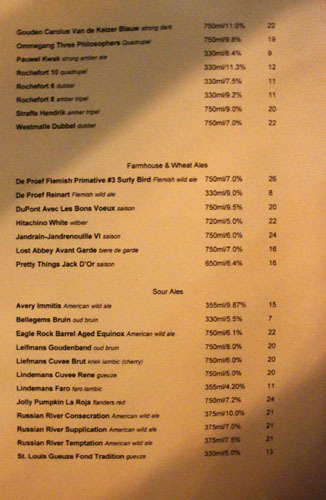 Not surprisingly, Belgian and Belgian-inspired biers are the focus here, and Sweeney has set up a rotating array of over a dozen beers on draft. 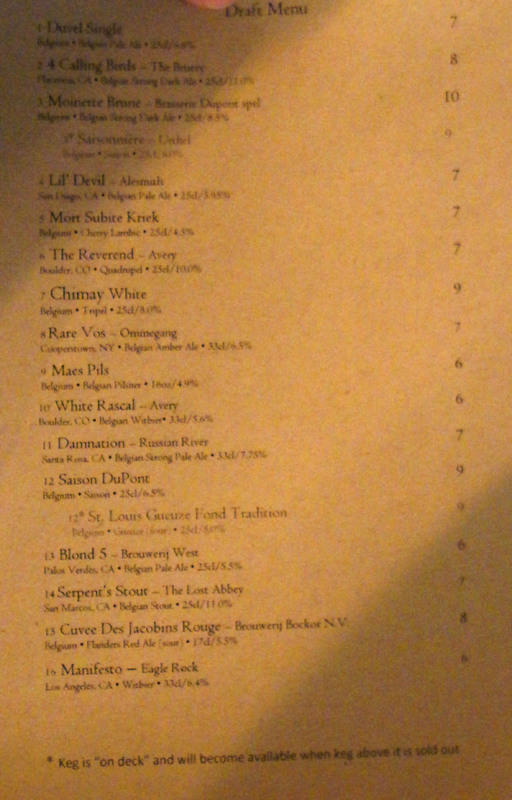 What's arguably more interesting, however, is the bottle list, which features some pretty hard-to-find stuff, stuff you just don't see all that often; I found the sour selection particularly engaging. I'm told that the list is going to be expanded further in the future, and there's even a great selection of liquors if beer isn't your thing (hint: try the Kiuchi No Shizuku--distilled Hitachino Nest White Ale aged in oak with coriander, hops, and orange zest). Click for larger versions. Upon being seated, two loaves of baguette were quickly thrust before us. 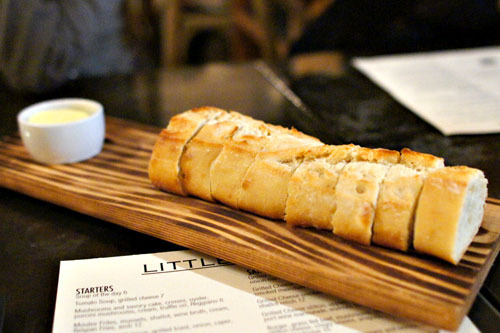 The bread, imported from France, was prototypical of the style, and came accompanied by a deliciously salted butter. 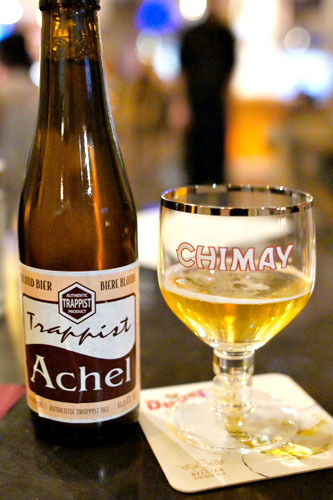 Given the nature of the beer list, we let Sweeney pick our booze, and he started us off with the Achel 8 Blond [$11], a Trappist tripel from Brouwerij der Sint-Benedictusabdij de Achelse Kluis. It was a great example of the pale ale style, with a deliciously sweet, malty backbone offset by a hint of spice and a very balanced bitterness. 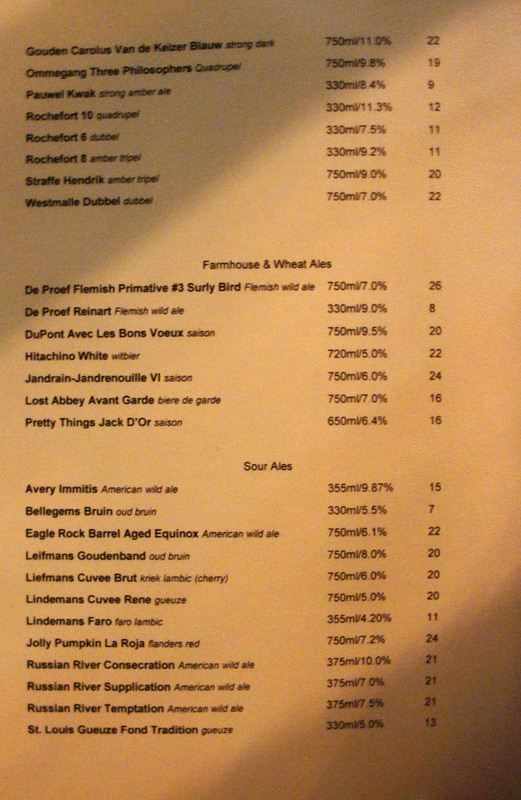 Note that we requested smaller glasses than what's typically used, hence the "Chimay" labels. 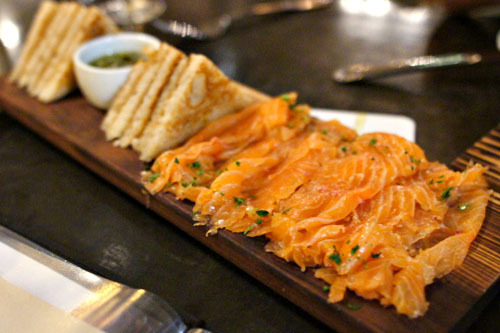 The Chef kicked things off with a gift of cold-smoked salmon. The fish was spot on, delicious alone and even better when taken with its classical accompaniments of onion and caper. 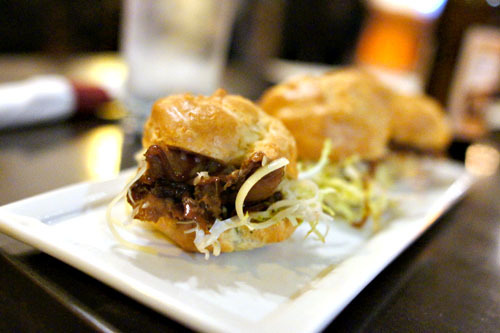 We wanted to try all three of the gougère options, and began with the duck confit version. I rather liked it, finding the bird soft, succulent, and slightly sweet, with the Gruyère adding a lovely bit of heft to the mix and the frisée providing a touch of levity. As good as the duck gougères were, these were even better, probably the best fried oysters I've ever had in fact. I loved their creamy, ocean-y goodness, contrasted against their crispy exteriors, and how the oysters' inherent salinity was perked up by the inclusion of bacon. Meanwhile, the tartar sauce and arugula contributed countervailing notes of piquancy that really tied everything together. 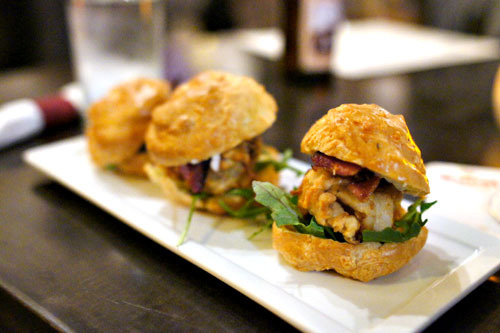 The pork sliders, finally, were probably the weakest of the trio, but still pretty damn tasty. As you'd expect, the belly was luxuriously fatty, with a mouth-watering pork-y relish that paired well with the mustard, while onion and mesclun greens moderated the dish even further. 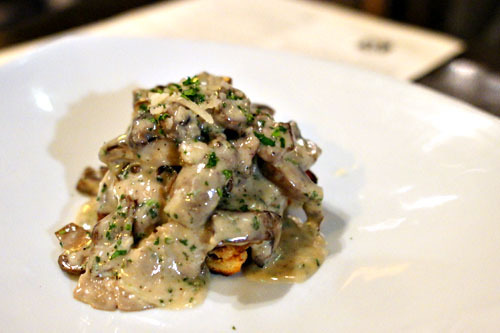 You can't go too wrong with creamy mushrooms and cheese served over what seemed to be a light polenta-ish cake. Think in-your-face, earthy, savory flavors, perfect with a cold beer. 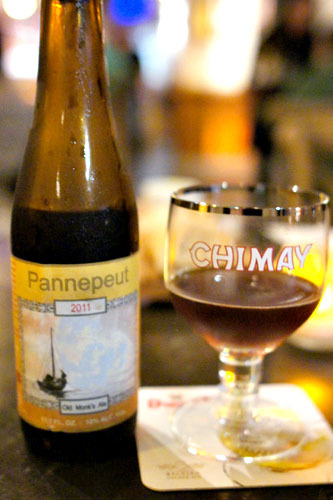 With our Achel gone, Sweeney served up the De Struise Pannepeut [$12], a strong dark ale also known as Pannepøt Old Monk's Ale (and not to be confused with Pannepot, a similar brew). It was stupendous, probably my favorite quadrupel-style beer ever, with a deliciously malty, caramel-y character utterly balanced by touches of spice and boozy astringency. Our first main brought us a beautifully cooked filet of salmon, still slightly rare on the inside and brimming with savory, salty goodness. The soubise sauce provided a great bit of tempering tartness, and I appreciated the earthy weight of the lentils as well. 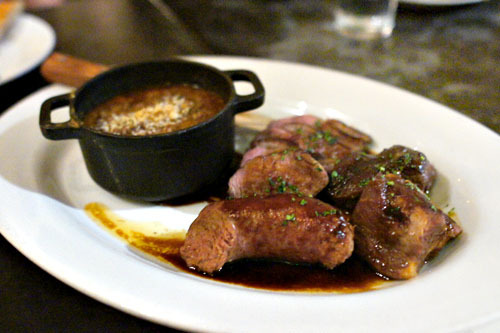 We followed up with a classic cassoulet. Multiple types of meat were present here, all heavy, all hearty, all showing off dark, savory flavors only slight moderated by the casserole of haricots blancs. 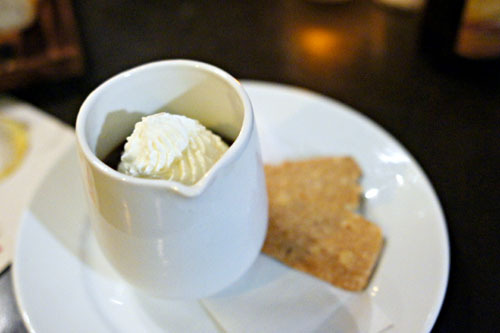 An interesting note: the vessel that the beans were served in came from Bastide. After the place shuttered, Guerrero attended an auction and snatched up much of the restaurant's cookware and dishware for cheap! 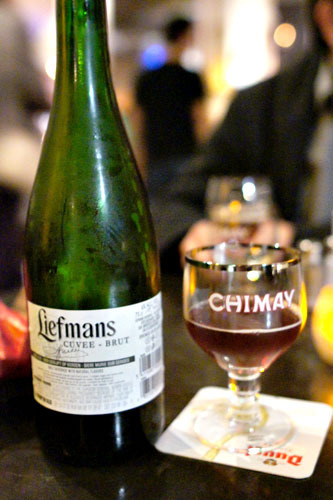 To close, Sweeney sent out a very fitting "dessert" beer: the Liefmans Cuvee Brut [$20], a kriek lambic from Brouwerij Liefmans. It was exactly what I wanted, a lip-smacking lambic loaded with a juicy cherry sweetness, but also supremely balanced by lovely pricks of tartness and a marked woodiness. Desserts at Little Bear are the handiwork of Pastry Chef Jan Purdy, and we were provided a complementary quartet to try. Click for a larger version. Nutella's always a smart decision--a rich paste of sugary, chocolate-y, hazelnut-y goodness, lightened by a topping of whipped cream, with some shortbread crisps thrown in for good measure. The Liège waffle was probably the most unique dessert that we had. Compared to your standard issue waffle, this was heavier and sweeter, with a lovely touch of caramelization on the crust. 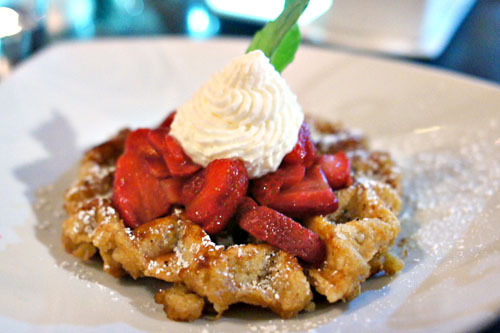 Excellent with its sugary topping of strawberry and whipped cream. 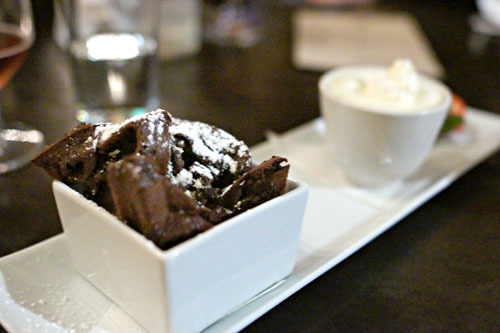 This next waffle displayed classic chocolate flavors, deftly balanced by the comparatively subdued white chocolate broth. We concluded with a delectable spread of cheeses, chocolates, and various other accoutrements. 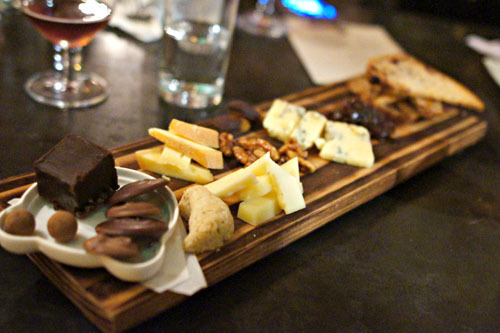 I'm not too accustomed to enjoying fromage with chocolate, but the pairings actually worked out quite well. Great for sharing. We ended up having a great time at Little Bear, enjoying a superb marriage of one of the coolest beer selections in the City with hearty, comforting fare that managed to complement, but not outshine the tipple. The place is a wonderful addition to the neighborhood, and it looks like Guerrero and Sweeney have another winner on their hands. Hey, the signed menu thing is a big turnoff in your reviews. It comes off as slightly snooty geekdom. I prefer not to want to thing of chefs as celebrities that need to be lofted on pedestals, what they do is special pyres, but special in that it is very basic in nature; they provide us with good sustinence in an artistic manner. I think your reviews would be far better, in fact, if you toned down the snoot factor a bit. Do a few non tasting menus. Discuss why you think a food will pass muster to the general public. Try some thing for less than $17 and up entree range. Are you reviewing food, or showing us how so special and awesome you are. Right now, it comes off as the latter. Lighten p a bit. Enjoy it. Get a little normal. Wow a bit harsh? So because somebody likes to eat out at places that tend to be pricier it's snooty? Sometimes even those of us making little money want to get out and try something special with someone special sometimes. This blog is a great reference for those who are travelling into LA or the natives who don't have the money to each at all these places. Why should he dumb himself down to the general public? That's what Yelp is for. If you can appreciate refined food then clearly you are the target audience for this blog so why did you bother spending so much time writing your comment? The joy of anonymity is you can say that something as stupid as that. 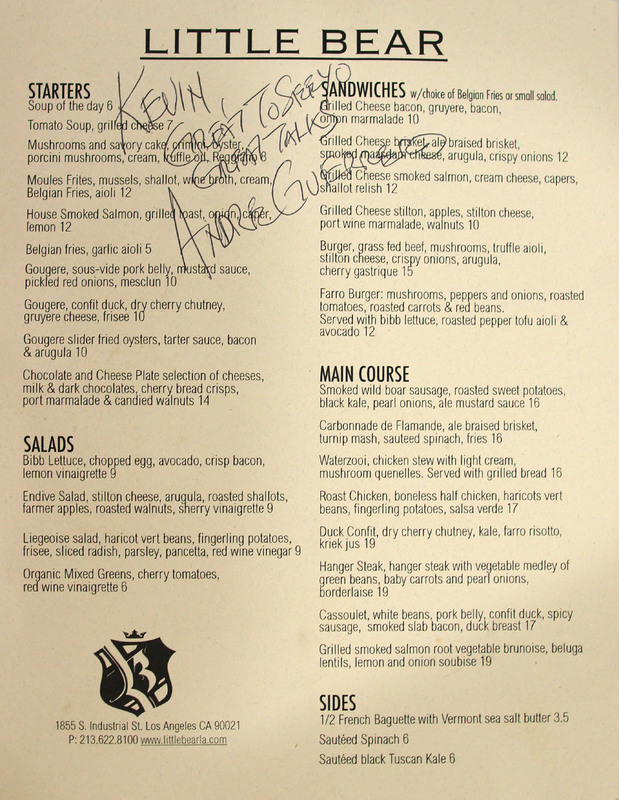 I've had dinner with Kevin plenty, it has never involved a tasting menu. And we've been places that have are under $17 dollars for an entree. Maybe you need to do some more research on where the kid actually eats. I'd start off by actually reading his blog instead of making generalizations. A lot of places that are under $17 an entree are chain restaurants, whether local, regional, or national. As one of the other commenters mentioned, when deciding where to spend money, it's nice to get another person's experience and opinions. I don't know Kevin personally, but given the numerous reviews he's done, I don't get the impression that he is "snooty", purposefully or otherwise. 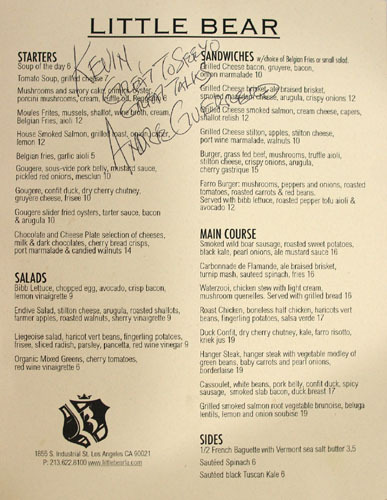 My impression of the signed menus is that, given his enthusiasm for the culinary world, he is more interested in signatures for personal mementos. The fact that he posts the menus online seems like more of a favor than anything else. Thanks for chiming in everyone. I hardly think $17 for a main course is excessive. I mean Olive Garden has entrées in that range, as Josh alluded to. In the end, I'm going to go to the places and order the items that interest me, and that will hopefully give me the best meal possible. I have no desire to try to predict or to emulate the experience of the "average" diner. I aim to give the kitchen as much free reign as I can, and yes, at times that may involve tasting menus and the like. Anonymous - Hey, I think yelp might be more up your alley. You may feel differently if you consider the differences between paid reviewing and being a food fan in general. Kevin - I like the mix of cheese board with fromage, I wish more places would offer something similar. Jealousy is a strange thing Kevin. I wouldn't come to your blog if it was for the "general public." the general public thinks Olive Garden is great Italian food. Don't mind what "Anonymous" said Kev. He or she is just hating on all the delicious food you always eat! Where you decide to eat is your business. This was a great dinner! So much for my diet and leaving early that night. LOL! The oyster gougeres (or according to Matt: googley eyes LOL) and cheese/chocolate plate were my favorites. Roddy: Likewise. So what's the latest on your move west? WWDBKevin: Word. Speaking of The Garden, here's an interesting piece about the restaurant. Marian: Haters gonna hate. It was nice seeing the team though. When's our first official meeting?